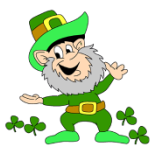 St. Patrick's Day is a very festive holiday and is celebrated annually on March 17th. The Irish have observed this religious holiday for thousands of years. Now a days, St. Patrick's Day is widely recognized and celebrated throughout the country with Irish festivals, parades, food like corn beef and cabbage, drinking, prominent displaying of the color green and Irish traditions.